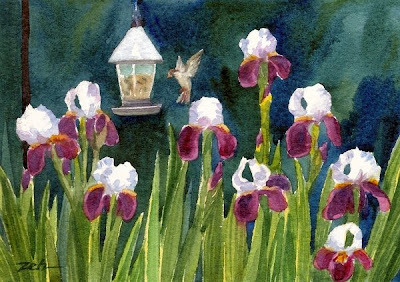 A sparrow visits a birdfeeder in the midst of a bed of lovely irises. Today was a lovely summer day. I went for a ride to take some pictures for a pet portrait - cute little Corgi mix. It's always nice to have the chance to visit the animal I'm going to paint. That doesn't happen all the time, but when someone lives close enough, I try to do that. Along the way, of course I noticed the flowers in bloom. There are still some iris amazingly, daylilies and lots of blue hydrangeas. Plenty of subject matter for a few paintings!